I would like to highlight the concern that I believe motivates many retirees and no doubt UN staff federation representatives, while I do not presume to speak for either group, about one of the seemingly overlooked issues related to the Fund, i.e, the human reality behind the payment backlog. Many of us have concerns when we read newsletters and other reports about Fund activities, about whether sufficient priority is given to addressing the plight of suffering new retirees, separated staff and survivors behind ‘non-actionable’ cases, where some have lost their houses, where others have died while waiting, where vulnerable widows and orphans continue to wait in vain. The United Nations is an organization based on “human rights, in the dignity and worth of the human person.” Yet, there are currently vast numbers of former staff and their families and survivors, who are enduring untold suffering, many for more than a year, because of delays in receiving their pension and separation payments to which they are entitled by dint of their toil, and in many cases, by dint of their blood, for those who have made the ultimate sacrifice in the performance of their duties. For several months, the Fund and DM have published reports purportedly concerning the extent and status of the backlog in pension payments. Yet, they contain information only about ‘actionable’ cases, most recently in an iSeek message from the Department of Management, dated 9 November 2016, which states that there are 673 pending actionable cases as of 31 October 2016. The Board of Auditors report reveals that fully 85 per cent of death-in-service cases and 91 per cent of retirement and withdrawal cases “were processed with delays ranging from 16 days to more than one year”, and more than 3000 cases because of missing documentation. (BoA.10, 11, pp.8-10). Those statistics are for the year ended 2015, and only for cases of missing documentation. What of the other non-actionable cases? There’s every reason to believe that these figures have multiplied since then. How many of these non-actionable cases existed before 1 October? How many are there as of 31 October? The recent iSeek message offers no clue. Do these cases account for the discrepancy in the figures provided by the CEO (90 per cent of the backlog eliminated by 31 May 2016,) and CCISUA’s estimate (50 per cent of the backlog eliminated by 31 May 2016)? When will the OIOS audit report on the backlog, reportedly currently in your hands, be published? How is the Fund doing its part? The Fund is paid a reported $10 million plus each year (A/70/325, Table 8, “Administrative Expenses of the UNJSPF, 14 August 2015) by the General Assembly to collected required documentation for retirement and separation for UN and field staff. The large number of cases of missing documentation indicates that while the Fund deflects responsibility on to staff and employing organizations, the Fund has to assume some responsibility for failure to adequately do this task. Why is the Fund doing specifically to address this issue? The iSeek message says an ‘End to End’ review is being undertaken to ’simplify’ and ‘streamline’ the separation process and that it is being done with the ‘UN Secretariat and other partners’. That’s undoubtedly useful. However, there is a question of priorities. Are the same or more resources being used to address non-actionable cases as are being used to conduct this review designed to identify shortcomings in the current system? Who are the ‘other partners’ mentioned in the iSeek messages? Are they consultants? Do they include Price Waterhouse Coopers who prepared a ‘Whole Office Review’ for presentation to the Pension Board, reviewing IPAS and offering staffing and organizational recommendations concerning the Fund, which report included a memorandum from you endorsing its recommendations? How much was spent on the ‘Member Self-Service’ tool where retirees already receiving their pensions can see the amount of our monthly check (that rarely if ever changes, month after month, year after year) and whether our Certification of Entitlement was received, and ‘much more’, says the iSeek message. What does the ’much more’ entail? Was establishment of Member Self-Service as much or more of a priority than dealing with non-actionable cases? In setting up Member Self-Service, did the Pension Fund bear in mind, as noted by FAFICS in the Pension Board report, the limits of technology use among some retirees? 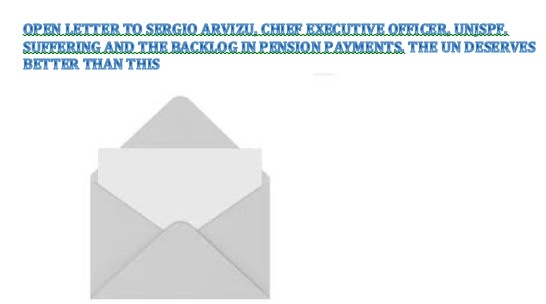 Did the Pension Board have human suffering in mind when it declined to hold an emergency meeting to consider an advance payment as requested by our staff union federations (CCISUA, FICSA and UNISERV) by letter of 18 February 2016 to the Board; when it ‘muzzled’ our staff federation representatives at the 2016 Board meeting, refusing to allow them to address the Board, as is the practice; when the Board made its members sign a confidentiality agreement whereby they are prohibited from sharing information with us, the stakeholders and participants; when it decided to make a provisional payment “within three months of receipt of all documentation. . . limited to 80 per cent of the estimated monthly benefit payable”; when the Board, and our FAFICS representatives (Federation of Associations of Former International Civil Servants) gave high marks to your performance and pushed to renew your contract a year in advance? The UN has its shortcomings, but unquestionably there are dedicated and committed current and former staff throughout the Organization, including in the Fund, who are devoted to ensuring that it lives up to Charter principles and ideals. According to CCISUA, there are staff who are being retaliated against for speaking out about shortcomings in the Fund. Perhaps you could ask your Senior Communications Officer whether he had in mind the human suffering at the heart of non-actionable cases when he wrote a 1500 word post on Facebook on his lunch hour last week, taking to task UN staff federation representatives and concerned retirees in response to a comment by a retiree related to a Fund newsletter he had posted. After posting the following response to my 31 questions prompted by his statement: “thank you for the questions, I am happy to have been asked and will do my best to respond with full clarity... the soonest”, he directed me to the Fund website, the Pension Board report, and Board members, in full knowledge that the questions, let alone the answers are obscured from sight. Again, who is listening to these silent voices of suffering? Are they mere casualties of bureaucracy, not worthy of being cited even in statistics -- out of sight, out of mind? The Fund belongs to us, its participants and stakeholders, who are the UN. The Fund, as much as some may strive to divorce it from UN rules and regulations, is the UN, and must uphold Charter ideals and principles. The UN deserves better than this.